One of the headaches of modern aircraft designers is the location of the air brakes, as they must be positioned so as not to interfere with airflow over the tail empennage. Variations on the theme are shown by this Chance-Vought F8U-1P Crusader. 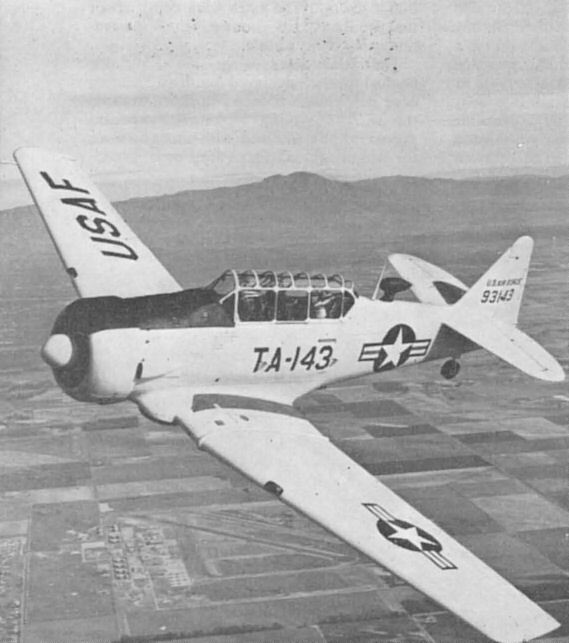 The North American T-6 Texan (Harvard) has been used for training the pilots of thirty-four different countries, and it is still in service today. One of the headaches of modern aircraft designers is the location of the air brakes, as they must be positioned so as not to interfere with airflow over the tail empennage. Variations on the theme are shown by this North American FJ-4B Fury, its brake is in four sections, two of which can be seen in this photograph. Note also the long flight-refuelling probe and underwing tanks. New use for the Martin B-57 is as a test aircraft by the Civil Aeronautics Administration for checking airways facilities. For the first time by either civil or military forces, the exact location of en route and terminal airway aids can be checked at the altitudes (40,000 ft.) at which future aircraft will fly. Previously the C.A.A. had no aircraft which could reach these altitudes. Modifications and designations, two words that make the life of the aviation enthusiast interesting or frustrating respectively. The former often alters the shape of the original design as in the case of the Fairchild C-123 assault transport. This aircraft (4647) is fitted with a newly-developed wheel-ski system, not to be confused with the Stroukoff "Pantobase" equipment. The large fairing on the underside of the nose houses the retracted forward ski. The same aircraft is shown with Fairchild J44 turbojets at the wingtips. When not in operation the air inlets are covered by retractable "eyelids". New member of the Douglas B-66 family is the WB-66D weather-reconnaissance tactical aircraft. Externally identical to the B-66, the WB-66D will be used for collect­ing meteorological data over a combat area. Precise cloud information and other vital data will then be radioed to operations, who can dispatch bombers to their targets at the exact moment when conditions are most favourable for maximum effectiveness. 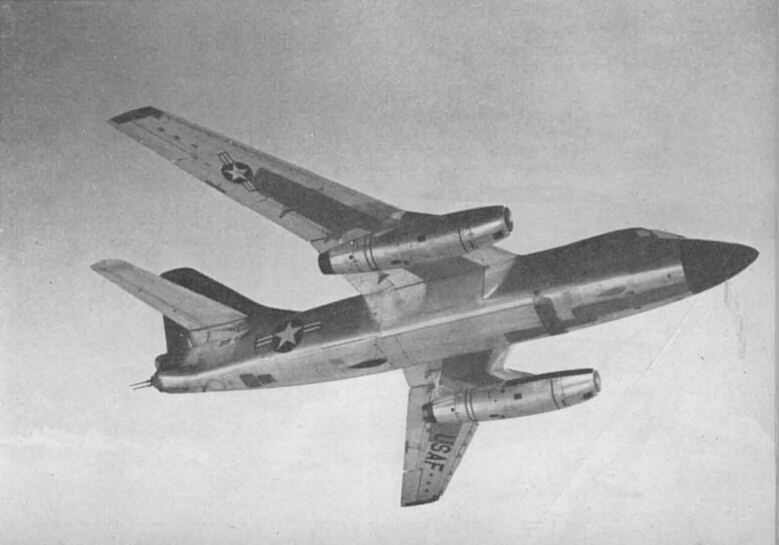 Other versions of the B-66 are the RB-66B night photographic-reconnaissance bomber, and the RB-66C, an all-weather electronics reconnaissance version. Except for minor modifications in instrumentation, the flight compartments of all three aircraft are identical. Internal mods, alter, more often as not, the designation of an aircraft, in this instance the Cessna Model 310B, which also has a new exterior paint design. The same aircraft for the U.S.A.F. becomes the L-27A. This is the first of eighty 310s now being delivered.